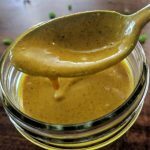 A sweet and delicious coconut curry sauce. Perfect for dinner tonight! In a medium sauce pan, heat oil and curry powder for about a minute. Add the coconut milk and turmeric and heat until reduced to your desired thickness. I typically only cook it for a few minutes before taking if off the heat. When it’s as thick as you’d like, turn off the heat and add the lime juice, coconut aminos, and fish sauce. Stir until combined. Store in an air tight container in the fridge. It should keep for about a week.